Weaving Is Your Passion? Visit The Pringgasela Village! 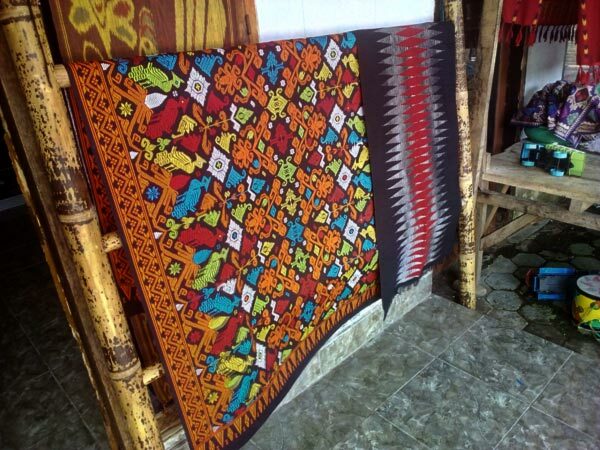 Weaving is a very popular craft in Lombok, along with pottery and fishing. The locals have been perfecting their skills for centuries, passing the knowledge down to the younger generations. The Pringgasela Village is one of the centers of weaving on the island, and today we’ll see what it’s all about. As you might already know from my other reviews, the women do all the heavy lifting – that’s how it’s been since the old days. They are better at this craft than the fellas because of the slight of hands, which leaves the men only one option: to try and find a job abroad. While in a foreign country, they send most of the money to their wives to support the kids. Furthermore, some of that cash is used to improve the Pringgasela Village (same is true for other communities in Lombok), and that is exactly why you’ll be impressed by the great condition of the houses, the streets, and everything else in between. Giving back is not just a fancy phrase for these people: they are used to taking care of each other and do everything in their power to turn the village into a better place. If you like to watch the masters at work, this tourist spot is perfect for that. Note: even though the locals are all nice and friendly, try not to disturb them while they’re working, because weaving requires not only skills but also dedication and focus. The atmosphere in the village is awesome. It’s peaceful and has a very calming, relaxing effect. If you want to buy some souvenirs for your loved ones/friends, check out the art shops nearby. Don’t worry, the owners of these shops aren’t pushy at all and won’t try to sell you things you don’t even need. So, take your time and browse through the entire collection. The staff will help you find just the right items; the only downside is that very few folks around here speak English, and unless you know Sasak, it will be almost impossible to interact with the Pringgasela village. Still, the universal language of “I give you money you give me the product” applies. When you take a stroll down the alleys, you’ll be surprised by the fact that almost every single lady is out on the street working on her weaving-loom. Yes, they aren’t the lazy type, that’s for sure, and like to work hard to provide for their children (just like the men that work overseas). By the way, women here weave not only to sell the stuff to the tourists, but also for their own use. That is one of those things that make this village stand out. I have to mention that Pringgasela is among the most organized communities in Lombok (and I’ve seen many). People live in harmony with nature and thank their gods for blessing them with the gift of life. As I just said, you’re free to watch the ladies do their work. And for us all to understand just how much effort weaving requires, let me take you through the entire process. First of all, the women wash the cotton strings. Next, they bathe them in some sort of natural coloring (indigo is a good one). Before the strings are ready to be used in weaving, they must be hung up somewhere shady. Once the strings are completely dry, the ladies put them to work. That’s when weaving, the main part of this whole “adventure”, starts. I did mention that it takes a lot of knowledge and experience to weave high-quality stuff, right? Well, it’s never too late to learn something. Now, even though I told you not to bother the women while they’re busy working, they are always happy to talk to you and share some interesting stories. That’s a huge part of the Pringgasela village’s charm: the friendly locals that aren’t shy to take photos with you and discuss the latest world news. The sturdy, beautiful cloth made by them is quite affordable, even though it is made of natural cotton and is of the highest quality. The choice is truly impressive: you’ve got a wide range of colors to pick from, starting with something classic like white and cream and ending with bright, joyful colors like green and orange. Now, for dresses and other outfits, the aforementioned fabrics are great. But the weavers in Pringgasela also make looser materials that are perfect for stuff like shawls along with super-thick weavings that are used for making carpets and mats. So, as you can see, the citizens of this village handle everything. And, they are a great example of a tiny community putting in hard work and conquering international markets. That’s right: the tourists aren’t their only clients – some worldwide companies are also very much interested in their product. I’m not a fan of clothes, but a friend of mine (a young woman) who was with me on this trip purchased a whole bunch of stuff. I bet you’ve heard about or even visited the grandiose Mount Rinjani. The Pringgasela village can be found on its foothills. The rice fields that you’ll see on your way to the village are very beautiful and inspiring. The air in Lombok is always nice and clean (except for the beaches that are full of trash), and the crisp atmosphere of this weaving community will make you fall in love with it. I wonder sometimes: how would this island look if the American managers and corporate agents were to take over? Would they transform it in a good way, or just ruin all those things that make it special? Things are probably better the way they are. You might think that the women of the Pringgasela village use top-of-the-line machines for weaving, but that’s not the case. They prefer the old-school wooden tools. Remember I mentioned the plentitude of available colors? It’s worth mentioning that natural resources like wood and leaves are used to create a palette of colors. At the same time, if it’s necessary, the women add some chemicals to make things easier and faster. Here comes the sad part: Lombok is a developing island, which means all the little girls go to school. That leaves them very little time to master the art of weaving. And don’t get me started on the modern-day treats like TV, online chatting, and phones. The citizens of Pringgasela have a plan: they want to open a weaving school. If they fail at teaching others how to weave properly, the techniques will simply be lost. On average, it takes a person a decade to truly master weaving. Imagine how worried the modern-day women of the village are these days! Every single woven item is special and unique both in color and pattern. So, if you want to take in as much of Pringgasela as you can, make sure to have a delicious meal at the local weaving community. By the way, I bet you didn’t know that according to a decades-old tradition, before marrying a man, a woman from the Pringgasela village has to weave one tiny piece of high-quality fabric for her beloved. It’s a symbol of love, respect, and devotion. Get this: to make a piece of cloth, a girl needs up to a full month! As for the price tags, you’ve got a range between 200K IDR and 3Mil IDR (that’s ~15 dollars to 220 dollars). Alright, now let’s try to pinpoint the location of this village on the map. It is approximately 55 kilometers away from Mataram, and it will take you no more than one hour to reach the destination. That is if you rent a car or a motorbike. A taxi driver might be able to get you there faster, but he will charge more. Public transportation is the least expensive option. But with it, you’ll have to board not one, but several buses at different stops. Unless that’s exactly what you’re looking for, I suggest you choose to rent a personal vehicle. You’ll be riding through Narmada and Kopang. When you enter Masbagik, the Pringgasela village will be minutes away. There are no hotels/guest houses in the area, but if you’re staying in Mataram, they won’t even be necessary. Use the rented car/bike to drive around the island and go back to the city at the end of the day to have a good night’s sleep. I was surprised at first to see almost no men in the village. Later I learned that it's normal for Lombok. The young girls are more worried about their phones than the craft, true, but not all of them. Pringgasela isn't the only weaving village on the island. But, just like the other ones, it's very friendly and you'll be satisfied by your trip - I put 10 bucks on that. In America, we're used to taking care of our farms and livestock. In Lombok, the women weave 24/7 and make a living on it. Perfect! Still not sure whether you should visit or not? Give it a chance. I did that a year ago and now I consider the trip to Pringgasela one of the finest experiences in my life. Really? It requires you up to TEN years to master this craft? Makes you respect the ladies that know their way around the art.